Heat a large skillet over medium-high heat and add 2 tbs butter. Add the mushrooms and cook, stirring frequently, until they begin to brown; remove them and set aside. Slice chicken breasts in half lengthwise. Flatten each piece between 2 sheets of waxed paper or plastic wrap with a meat mallet to about ¼-inch thickness. Dredge each flattened piece in the flour. In the same pan you cooked the mushrooms in, add 1 tbs of the butter and heat over medium-high heat. Add 2 chicken breast pieces and brown well on all sides. Remove and set aside. Repeat the browning process 2 more times (using a tbs of butter with each shift)–you have to do this in shifts so the chicken is not crowded in the pan and browns evenly. Don’t drain the drippings, you need it for the marsala sauce. Preheat oven to 450 degrees F. Lightly grease a 13×9-inch baking pan. Add the chicken breasts to the prepared baking pan, overlapping each piece slightly. Sprinkle evenly with the mushrooms. After all the chicken is browned, using the same pan with the collected drippings, add the wine, chicken stock, salt and pepper. Bring to a boil, reduce heat and simmer uncovered for 10 minutes. Pour the sauce evenly over the chicken. 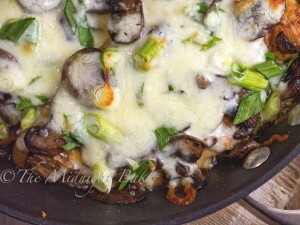 Mix the cheeses and green onions and distribute over the top of the chicken. Bake for 15-20 minutes until cheese is melted and just starting to brown.